Are you interested in the 2019 Volkswagen Jetta? The all-new Jetta is packed full of features that are impressive no matter who you are. This compact sedan is equipped with a turbocharged engine that provides 147 horsepower and 184 lb-ft of torque. Even with this power, the 2019 Jetta is efficient with an estimated fuel economy of 30 city and 40 highway mpg. The Jetta has available drive selectable modes to choose from. Drivers will be able to choose from Normal, Eco, Sport and Custom. Each mode offers a different feel and different benefits. Just because it is a compact car does not mean that it is missing any of the safety features. Safety features included with the 2019 VW Jetta include the Intelligent Crash Response System, Automatic Post-Collision Braking System, Tire Pressure Monitoring System and the seven stability-enhancing systems. When it comes to technology features, where do we begin? The 2019 Jetta is able to save up to four personalized driver profiles that are shown on the Volkswagen Digital Cockpit display. Drivers can easily connect their smartphone or take advantage of the in-car available Navigation System to help you find your way. While you are on your way to your destination, the available driver assistance features are in place to give you confidence in your ride. A few of these features include Adaptive Cruise Control, Blind Spot Monitor, Lane Assist, Rear Traffic Alert and more. These are just a few of the features that the 2019 VW Jetta has to offer. If you are interested, be sure to schedule a test drive today! 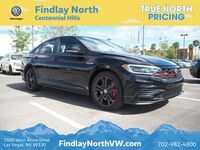 The 2019 Jetta is just one of the many vehicles that you will find here at Findlay North Volkswagen. Shoppers who are interested in the 2019 VW Jetta can easily schedule a test drive on our website for a convenient time that works for them. Stop by the dealership today to learn more or contact us with any questions!